The “half-bred Indian woman” is never identified by name, so we can’t be sure exactly who she was. From the perspective of the newspaper, it was more important that she was identified by race and not by name. And I find this very telling, because it points to a general negative attitude about Native peoples. “Miss Margarette Scott” was considered an upstanding white resident of Granville County and I found her name mentioned a few times in the society pages of the newspaper. 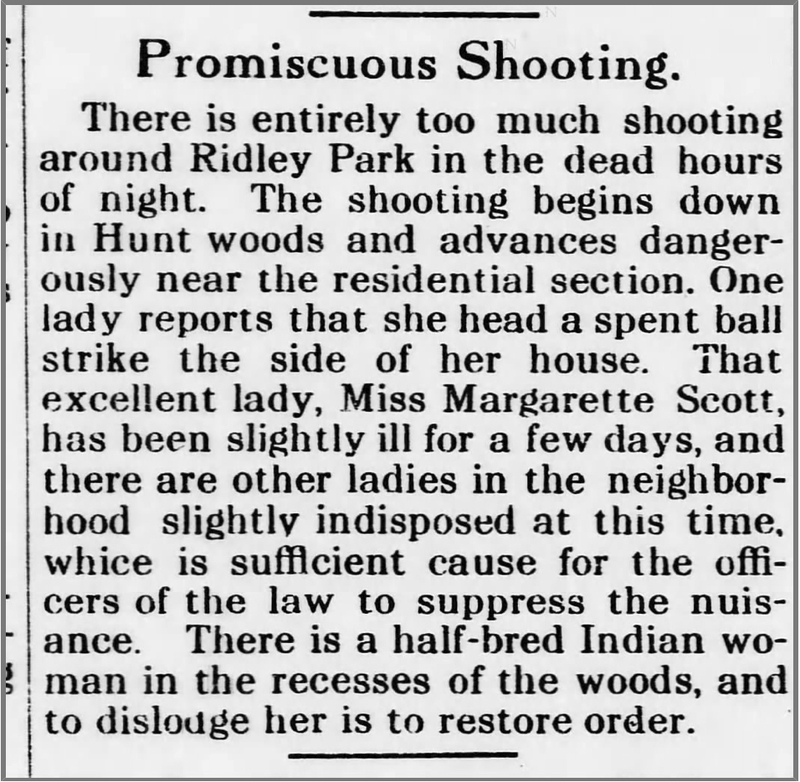 So in this 1912 article, we have a Native American woman accused of disrupting the serenity of a quiet white residential neighborhood. And the only solution that is presented is that the Native American woman must be removed from the area. This scenario sounds like a microcosm of the relationship between indigenous peoples and settler colonialism: Native peoples must be removed from the landscape to make room for “progress”. The Ridley Park residential neighborhood was located in the southeastern part of the city limits of Oxford. Hunt Woods was located directly to the east of Ridley Park. The Native American community was mostly concentrated directly below Hunt Woods but the families spread out in many directions including the Hunt Woods area. So it is conceivable that this unidentified “half-bred Indian woman” came from the local Native American community. I found another article published 3 years later in 1915 which provides additional information about Ridley Park and Hunt Woods. We can see that the area is remarkable for its picturesque setting that sounds like it came out of a Bob Ross painting. There are even locations in the woods named after Native American tribes and individuals such as “Hiawatha Rock”, “Seminole Rock”, and “Cherokee Rock”. This I find ironic, given that there was no problem naming places after Native peoples but actual Natives peoples living in the woods was a problem. I really enjoyed these articles. Thanks for sharing Kianga Lucas. Keep up the good work. Thanks for sharing the information. Great articles. Keep up the good work on early pilgrims. Loved it……Im sorry but I must ask you…..What type of person was my grandfather, William Percy Richardson…of Spring Hope Nc, Nash Co.….and who were my Mothers grand parents on her mothers side, the Braswells?….if you can…..
Th famous Jazz musician, Oscar pettiford, grew up in minneapolis, but descended from the Pettifords in this area. The white/black classification system is still alive and well in the hospital system and state and county run agencies in the south. I travel on work assignments and find I am fighting the hospitals/medical facilities everywhere I go about correctly posting my race as Native American. It is on all my information I have provided, but no one puts it on their computer systems. When asked, the response is always the doctors group you in white or black because that is how they look at your symptoms and treatments. I was shocked and proceeded to give my opinion on that. Really enjoy this blog! I am a descendant of John Bass/Love Harris; Edward Bass/Elizabeth Goin? My ancestor (Esau W. Bass 1760-1835) went to Mississippi from NC and my ancestors stayed there until my G-Father, Bruce Bass, left in the 1940’s and moved to Oregon. My family has been in Oregon ever since. Growing up I thought the Bass name was so unusual and we were unique. My fathers family (Randolph Bass 1927-1983) didn’t talk much about their roots in Mississippi; and certainly not NC or Virginia. I don’t think they really even knew. And, G-pa Bruce Bass was a very quiet man. Anyway, thank you for your research and sharing of this information. I appreciate the connections it brings to my ancestors. Some day I hope to visit all these areas and get a better sense of it too.